Video Note: This recipe was recently updated (on November 9, 2015) to include a video. Find the video post, here. Has my plan worked yet? Are you convinced that cleaning is the coolest activity in the world? Did I just date myself by using the word “coolest?” The nineties can really stick with a gal. Over the past month we’ve poured vinegar into jars filled with brightly-colored towels for cleaning dirty surfaces. We’ve given new life to the Swiffer sitting in the lonesome corner of the garage by making homemade wipes. Our bathrooms now smell amazing, and are actually enjoyable to clean thanks to the absence of mystery smells and liquids (potty-training also sticks with a gal and bathroom). Oh the magic of homemade cleaning. Homemade DIY cleaning is not only empowering and even a tiny bit magical (or maybe the word is “motivating?”), it’s also incredibly simple. And if you’re new around here, I love simple. 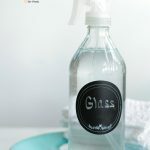 Simple enough that every single homemade cleaner I make only requires a few ingredients that cost little when compared to the price I used to pay for a massive number of individual cleaners from the store. Vinegar: Costing only a couple of dollars for a quart, vinegar can clean just about anything. 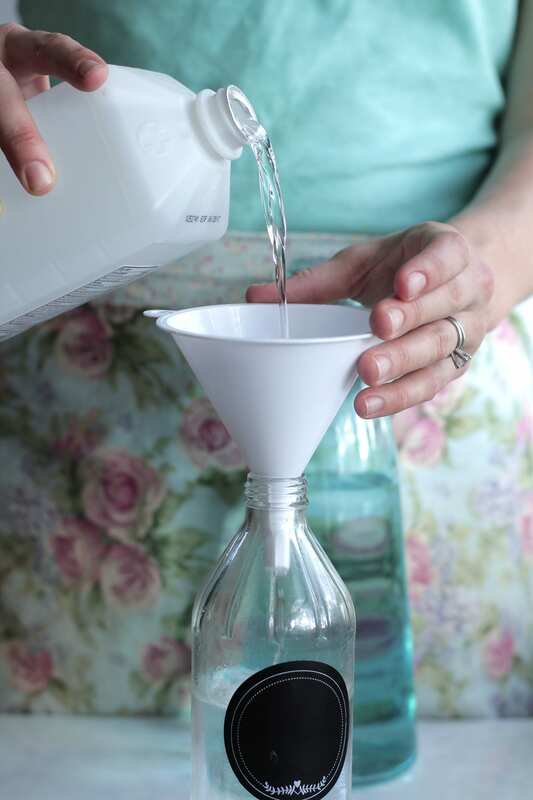 A big bottle of vinegar can easily be stretched to make anything from homemade cleaning wipes, Swiffer wipes, surface spray cleaner, or a natural fabric softener. Essential Oils: I use essential oils (particularly orange, tea tree, and lavender) in my homemade surface spray, cleaning wipes, Swiffer wipes, bathroom cleaner, laundry soap, hand soap, and even homemade beauty products. Water: If you turn over a bottle of store-bought cleaner I guarantee the first ingredient will be water. I use water in many of my homemade products. Water can aid in bacteria growth (not something you want when cleaning your counter). If you’re planning to use homemade products within a few weeks, tap water is just fine, but for a long-term use I suggest boiling water or using distilled water. Castile Soap: Castile soap is an incredible cleaner that’s made from 100% plant oils. It’s known as a “true” soap due to its biodegradable properties. Castile soap is concentrated and highly effective which means one bottle can create multiple homemade products such as: hand soap, laundry soap, and bathroom cleaner. Baking Soda: Baking soda absorbs odors (hello amazing bathroom cleaner!) and can remove the toughest of stains. Rubbing Alcohol: I’m sure many of us have torturous memories of this product as kids. Ever have a cut? Yep, painful! Rubbing alcohol is actually good for much more than torturing (I mean “cleaning”) boo-boos. This ingredient is used as a disinfectant and also works to dissolve dirt and oil. 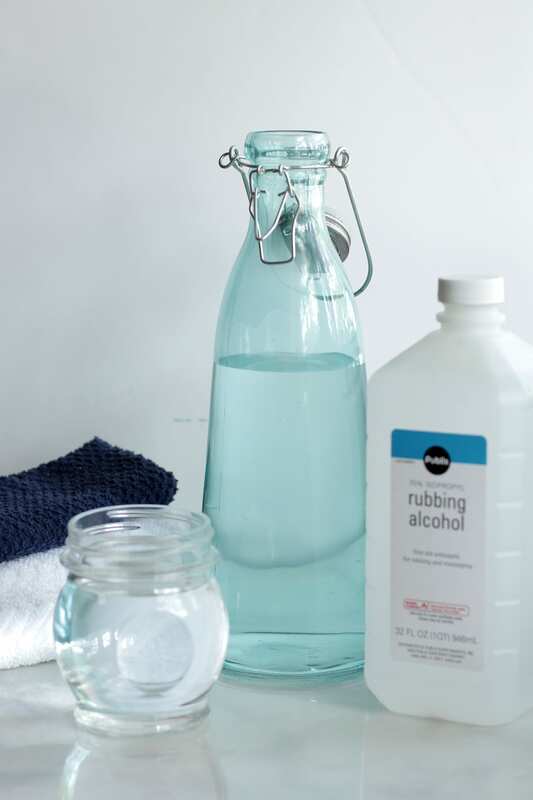 Rubbing alcohol dries quickly which makes it the perfect ingredient for DIY glass and stainless steel cleaner or homemade Swiffer wipes. Today, let’s kick up the cleaning motivation (I got it right that time) to a new level and sparkle some windows. Using the vinegar and rubbing alcohol already found in our homemade cleaning arsenal, this cleaner can be made in just five seconds (really! I promise…five seconds) and costs just pennies for an entire bottle. 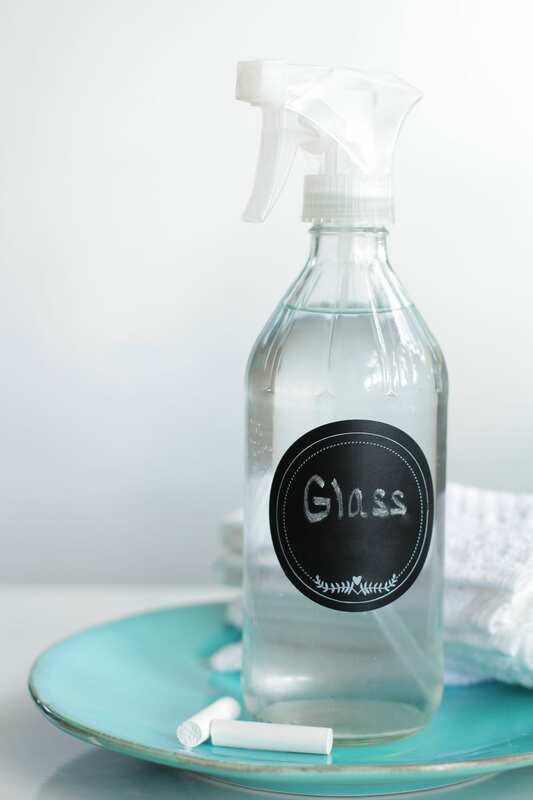 Homemade glass and stainless steel cleaner will leave your windows and fridge streak-free and sparkly without the overwhelming toxic smell of store cleaners. Ready to get started? I knew you would be. this cleaner can be made in just five seconds (really! I promise…five seconds) and costs just pennies for an entire bottle. Homemade glass and stainless steel cleaner will leave your windows and fridge streak-free and sparkly without the overwhelming toxic smell of store cleaners. 12 oz water Clean tap water is fine for short-term use. Use distilled or boiled and cooled water for long-term use. 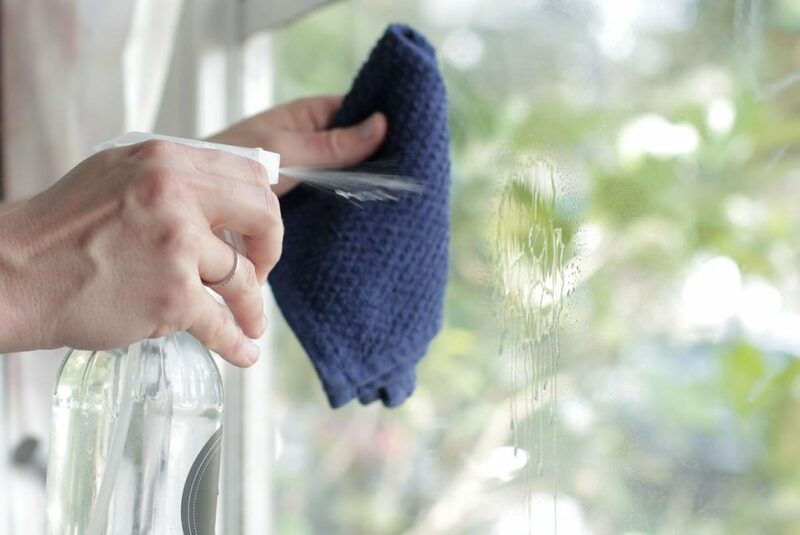 To Use: Spray the cleaner on windows and mirrors, then wipe with a microfiber cloth. A cotton towel may be used, but I highly recommend microfiber to achieve a streak and lint-free appearance. I've also used this cleaner on some of our stainless steel appliances with good success. Before using this cleaner on stainless steel always check your appliance manual since some appliances recommend using plain water for wiping the surface (like our new fridge). And always do a small spot test before using any cleaner on a surface. *I know some people in the natural community avoid rubbing alcohol for cleaning purposes. A high-proof vodka may be safely substituted for rubbing alcohol. Water Note: Clean tap water is fine for short-term use, distilled or boiled and cooled water is best for long-term use. If you’re looking for decorative chalkboard labels (pictured), I bought a package from Michael’s Craft Store. You can also find similar labels here. Love your site so much!!! I use baking soda to cleanup the tea stain on stainless steel sauce pans. They work like magic. I will try your cleaning liquid. Thanks for posting all these wonder posts!! Baking soda is pretty amazing stuff! I used to get so frustrated with store-bought stain removers and cleaners, but have been so happy with the powerful action of baking soda. Enjoy the glass cleaner. It’s amazing!!! Interesting combination! Who knew such a cheap cleaner was right under our noses! I love the labels too. Where can Castile soap be bought? Hey Suzanne, You can find castile soap at health food stores and even Target now! I buy my castile soap from Amazon in the large gallon-size jug. Love this glass cleaner! Throwing out the Windex today. I’m looking forward to trying a lot of different items from this site! Hey Elle, It should. I use it on all my stainless appliances and have to little kiddos :). The alcohol is the key ingredient for fingerless cleaning. I’m glad you found something that’s working best for you, Colleen. I just found the same recipe last night. The cornstarch adds something that makes the glass streak free! My mom and I ran around cleaning mirrors and windows. Lol. Sold – when you’re having fun cleaning. lol. Hi gr8 tips, what size bottle RU using 4 the window cleaner? Hey Tina, I use a 16 ounce glass vinegar bottle. Alcohol is the best window deicer to use also. I’m not sure about the vinegar in it, but maybe it will help to clean your windshield as you de-ice? Just a thought. I just tried your recipe and my s/s dishwasher has terrible streaks???? Hey Lisa, Hmmm. Did you use Isopropyl Alcohol (standard rubbing alcohol)? Between the vinegar and alcohol the stainless should clean right up without streaking. We have all stainless appliances, too. I did use standard alcohol. This mixture is wonderful for glass I just love it! I also use it in my bathroom. I am going to try it again on my stainless steel appliances today and see what happens. The stainless steel / glass and multi-purpose cleaners REALLY WORK!! I am thrilled beyond words!!! Thanks so much for sharing!!!!!!! ‘Live Simply’ has been my mantra since we moved to the east coast 2 years ago, but it takes time to get there. Tips like these are a Godsend and so very much appreciated! Thank you for sharing and I look forward to more! Yay! I’m so glad you like the cleaner, Ani. Enjoy!! I’m a little confused by the instructions. Did you use 1/2 cup of vinegar and alcohol mix and then topped off with water or 1/2 cup of alcohol AND 1/2 cup of vinegar then topped of with water? This solhtiondoesnt work cor stainless. I tried it according to diretions not even close to looking good. 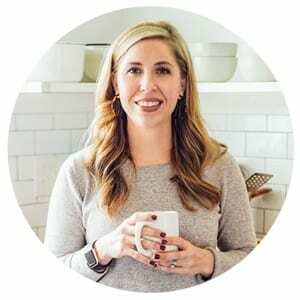 Hey Colleen, I always recommend a spot test first before using any cleaner on a surface, and also checking with your appliance(s) manual for best cleaning practices. That’s true for homemade or store-bought cleaners. Is there streaking on the stainless? Is the stainless the new kind that should only be wiped down with water, or have you tried using cleaners on it before? What kind of damage occurred? If it’s just streaking, then using a microfiber cloth and water may help, or purchasing a stainless cleaner from the store may bring the results desired. How do you normally clean the appliance? I would love to help you troubleshoot, I just need a bit more information on what’s going on. Vinegar and rubbing alcohol come in different % strengths. What strengths do you recommend ? Hey BR, I recommend using Distilled White Vinegar (5% acidity) and 70% Isopropyl Rubbing Alcohol. Can essential oils be added to this mix? Citrus perhap? Hey Aubrey, Citrus essential oils would be great in this recipe! Hi there! Will this work on mirrors? Hey Amanda, Yes, it will :)! 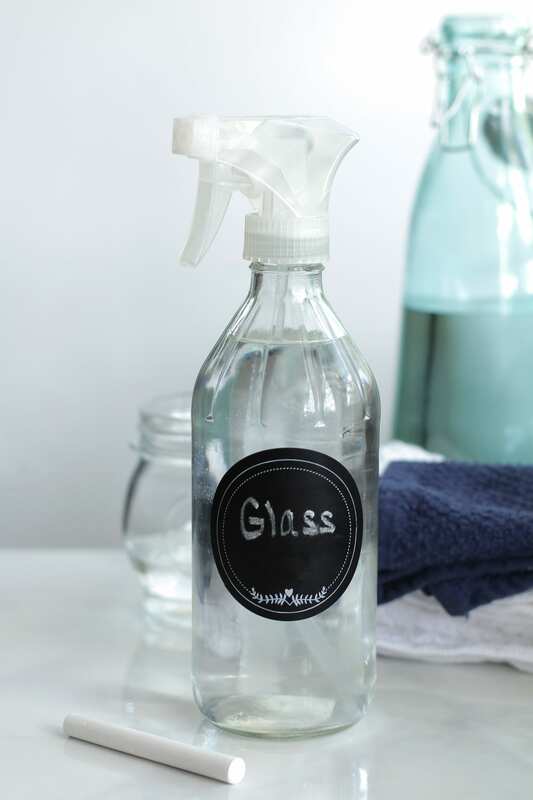 Where do you find the spray nossil to fit your glass vinegar bottle? Hey Ashley, I reuse old spray bottles (from when I bought cleaners). Another idea is to purchase the spray nozzles from the dollar store and just toss the plastic bottles. It didn’t work on my stainless steel either, but I do know that there are different types of finishes on stainless. Sadly, this does not work on my stainless steel appliances. There are different finishes for them and some are graded more fingerprint proof than others. There were some drip marks and fingerprints and this did help remove the fingerprints, but not the water marks. The water marks are removed with store bought SS cleaner, so I know they are not permanent. Thank you for the great feedback, Catherine! Yes, it’s very true–all stainless appliances are so different. At least now you have a great window cleaner ;). What do you wipe the stainless steel appliances with? A microfiber cloth? Hey Dana, Yes, I keep a microfiber cloth around for our stainless appliances. works better than the store-bought stainless steel cleaner. really amazing, thank you! Noticed that a lot of your natural cleanings call for a glass bottle, if I just want to reuse some plastic spray bottles I have laying around does that work also? Hey Abby, About a month. For everyone who’s having a problem with streaks being left after cleaning your stainless with vinegar, please try this as the second step and fix for the other types of stainless finishes mentioned above. Pour some olive oil onto a microfibre cloth and wipe with the grain of your appliance. The grain should be either vertical or horizontal. I have a mix of the two in my appliances. You can tell very easily. The olive oil polishes the stainless steel and gets rid of any other prints the vinegar left behind. Hope this helps. Please add this to my “olive oil” post above as it’s an edit, and please delete this one, if possible. If that’s not possible, then let this one stand too. My apologies for not getting it all in one post. I not only meant streaks but fingerprints as well. The olive oil should be put on after the vinegar solution has air dried, and you need to rub it in back and forth a few to several times (whatever is needed);”buffing” the stainless steel. This is truly “a little dab will do you”. You don’t need to use a lot. a dime to nickel size amount should go quite a long way, but use whatever you feel necessary. Just try not to use too much as you don’t want your appliances glazed with it. This works great as a glass cleaner!! As for using tap water, I’m wondering if it would be okay even if you didn’t use it within a couple of weeks because of all of the alcohol in there? Alcohol is a preservative right? Anyway, thanks for finally helping me find a glass cleaner that works! Hey Sara, I’m so glad you’re enjoying it! That’s a great question. I’ve personally kept it a bit longer, and haven’t had issues. I don’t have any studies to show how much longer it might last though. Where did you find the aqua tinted bottle with a swing cap that is in the pictures?? Hey KNgo, It’s from HomeGoods. Very nice and very easy method. Help, my appliances look Terri let after using the stainlets recipe. Don’t do it, it will be worse, does anyone have suggestions to fix the damage? Hey Natasha, Yes, definitely try the distilled water. The minerals in tap water can leave behind spots, similar to what happens when you do the dishes. I think that will definitely help! I tried this recipe and it worked really well! Thank you! Thank you for sharing and it helps alotIs the solution also works on Winshield and windows of the car? Hey Romeo, Yes, it should. Always test a small area first. I’m trying to move away from plastic, and I love you glass spray bottles! Where did you buy those? Once again, you rock! Thanks for a fabulous inexpensive multipurpose cleaner! Hi, I always use vinegar and soda for cleaning my bathroom. What do you think is it enough for this or should I need to use more cleaners? Thanks in advance for giving me the clarification. For me, that’s good, Harmon.